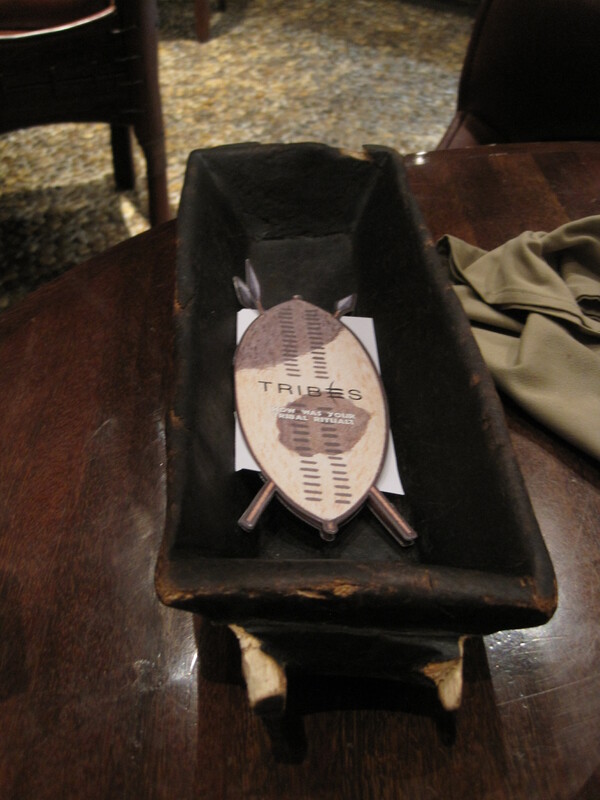 We dined at Tribes in the Mall of the Emirates because we’d heard it had fantastic steaks. 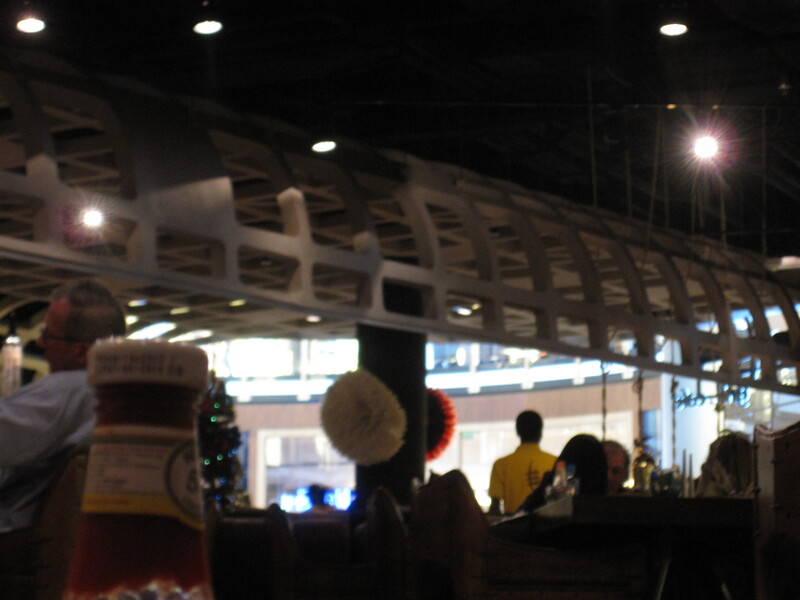 It’s advertised as an African Steakhouse, and it has the African theming down well – you forget you’re in a mall! 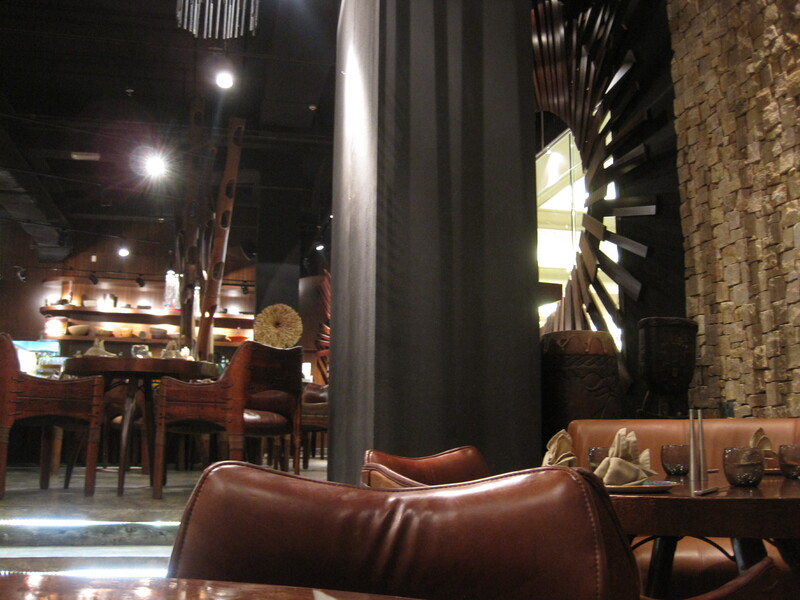 Feels like you’re walking into an African hut of some sort, and you can see the flames of the grill in the back, there are skins and furs on some of the chairs, woven reeds, just a fabulous sense of theming. Disney would be proud. Even their menus are beautifully themed, aren’t they? Just trying to show you a bit of the atmosphere we experienced. I wanted tile in my house like is on these walls. Till TBG told me I’d have to keep it dusted…..
We were happy, had just gotten off one of the Big Bus tours and we were starving! 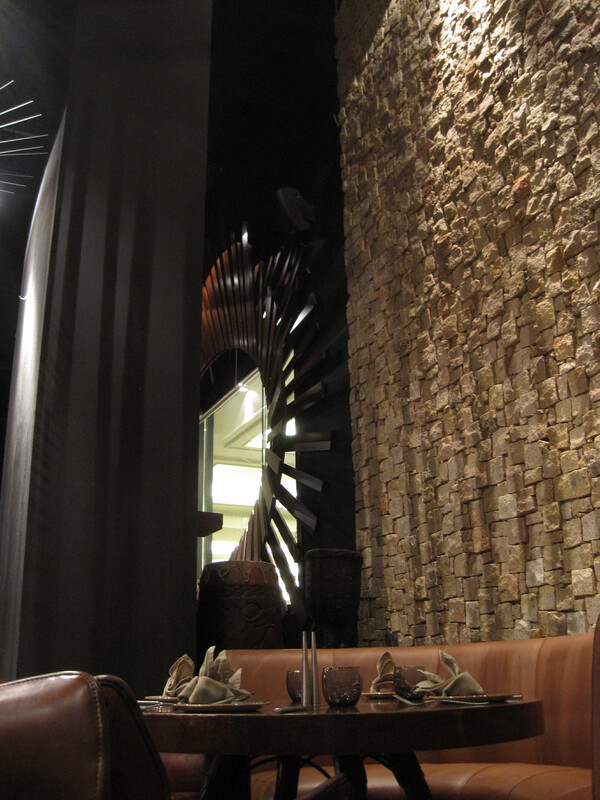 This is the bar area. No, they don’t serve real drinks with liquor. 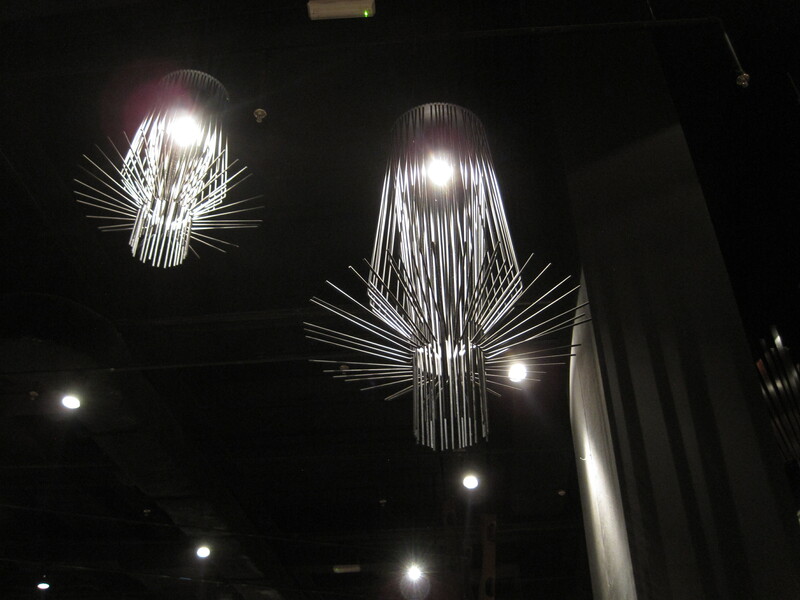 Pretty dang cool-looking chandeliers, huh? 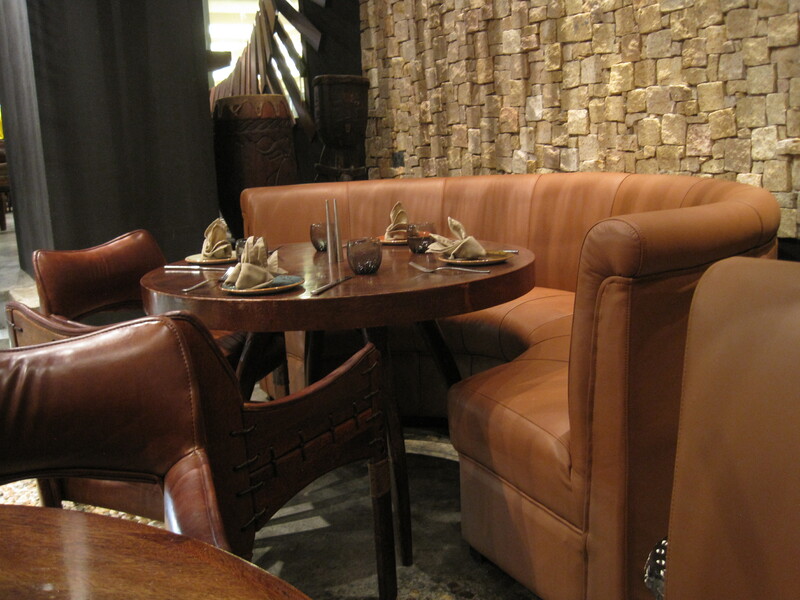 The seating areas are comfy and cozy, and great for conversations. 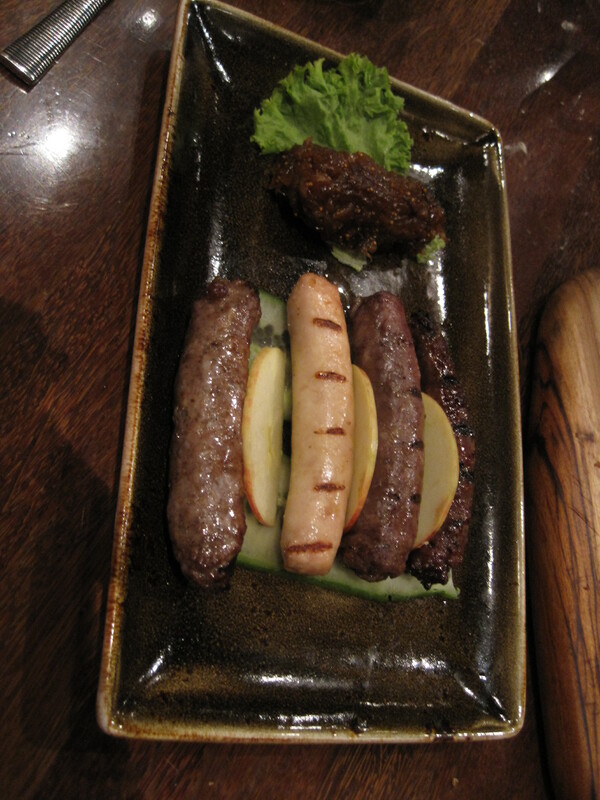 We ordered steaks, and a multi-tribal sausage platter as an appetizer. The sausages were interesting, the chicken one had little flavor, lamb was a bit more flavorful, the beef yet a bit more, but the camel was *quite* tasty. The onion and fig jam was gummy and difficult to enjoy. The bread they brought us I SWEAR I could have eaten nothing but that all night. It was crusty, warm, and wonderful. Appetizer – the sausage platter. 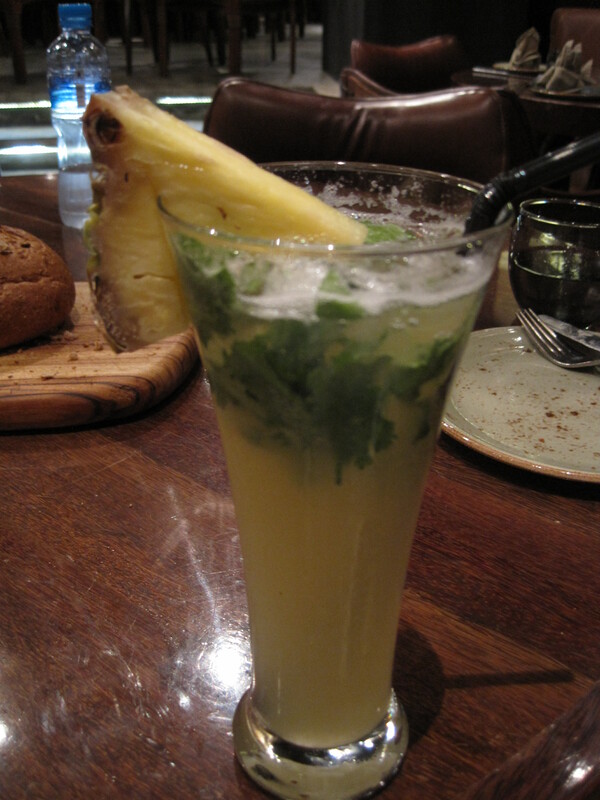 TBG’s “mocktail” – pronounced yummy as well. Yummm…. 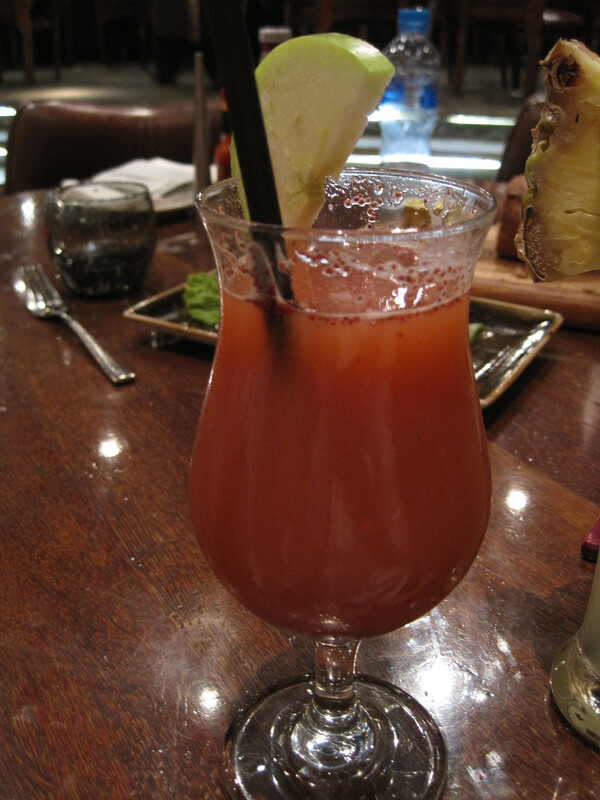 one of their “mocktails” – blended fruit juices. 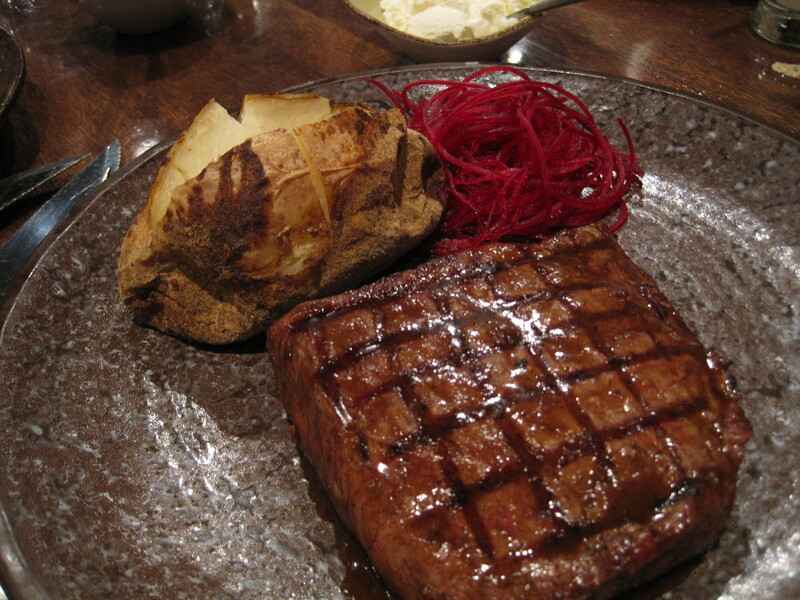 Our steaks arrived, and be aware that they’re cooked to a textbook level of doneness…… if you order medium, that’s exactly what you’re getting. The meat was nowhere near as tender as we’d hoped for, and the only flavor in the meat was within the sauce it was served. We were truly disappointed. 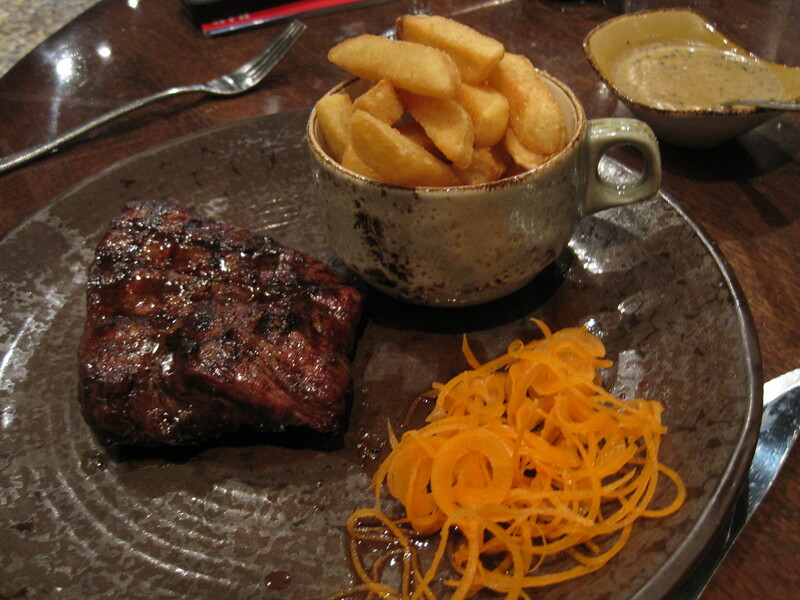 We’ve had better quality meat at a Longhorn Steakhouse chain in the states. The portions were substantial, though. 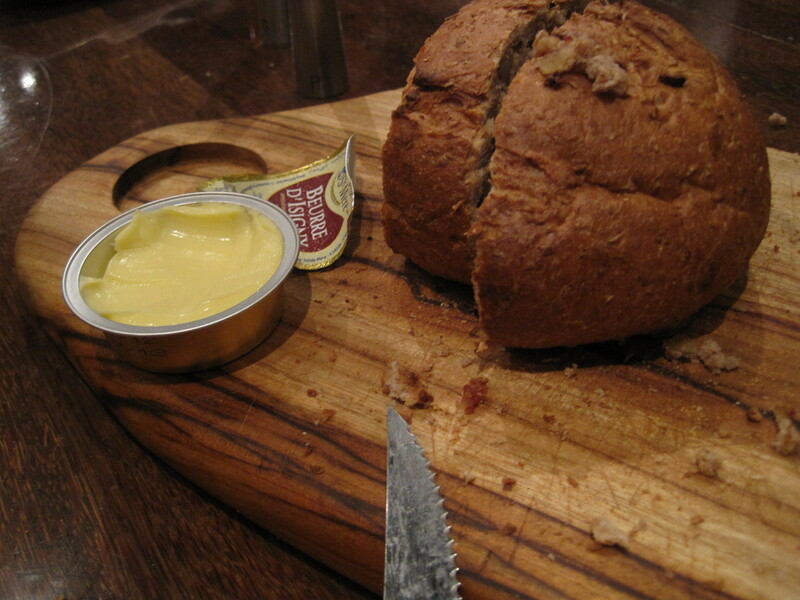 And the bread was *quite* delicious – full of grains and all sorts of goodness. We could have eaten another entire loaf. 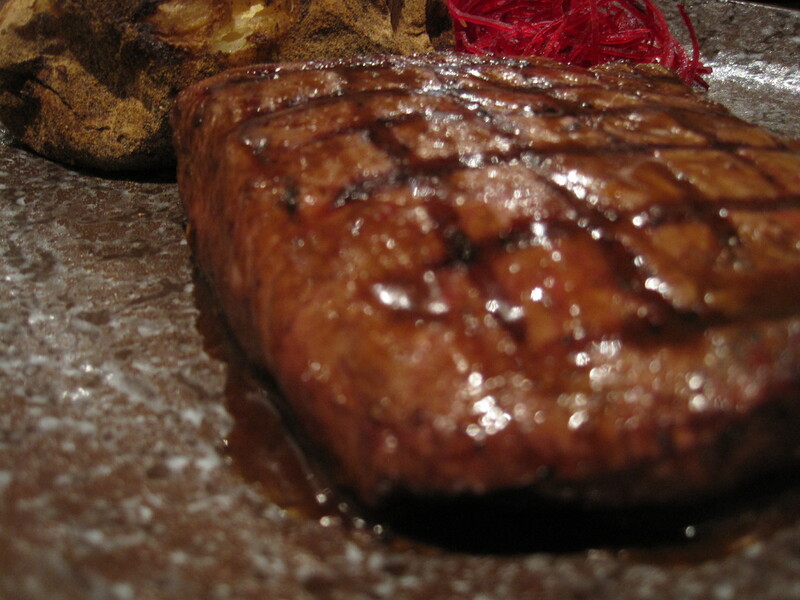 The attraction – red meat. 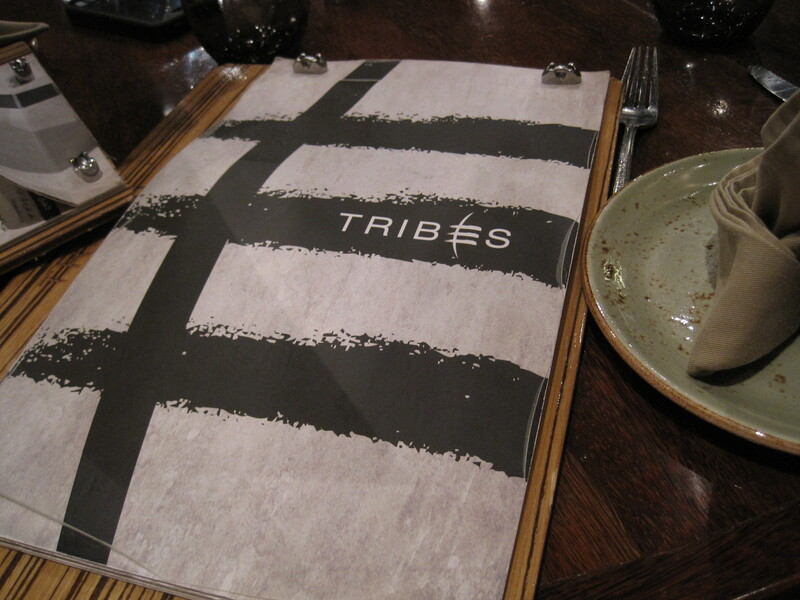 This place is for carnivores, for sure! 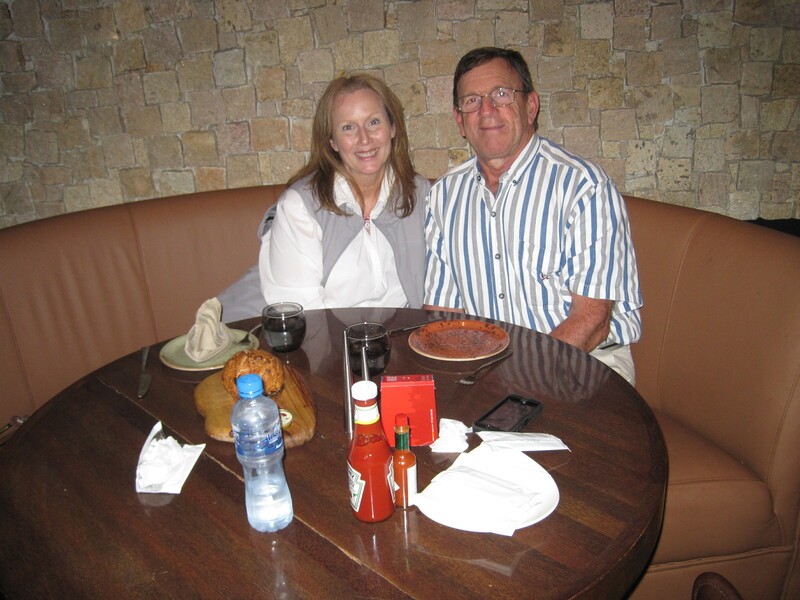 Again, the atmosphere was quite wonderful, our server knowledgeable and attentive, it was a fun place to eat. 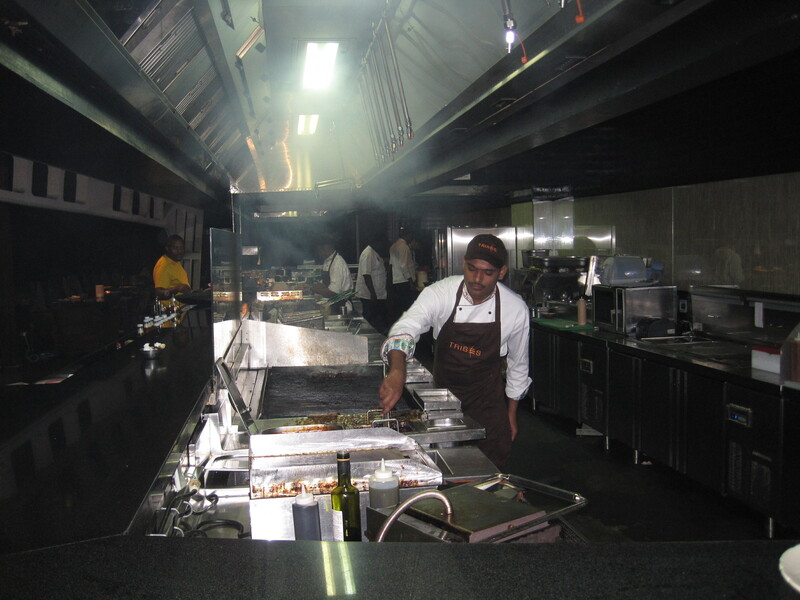 Here are some of the folks hard at work making the food served. 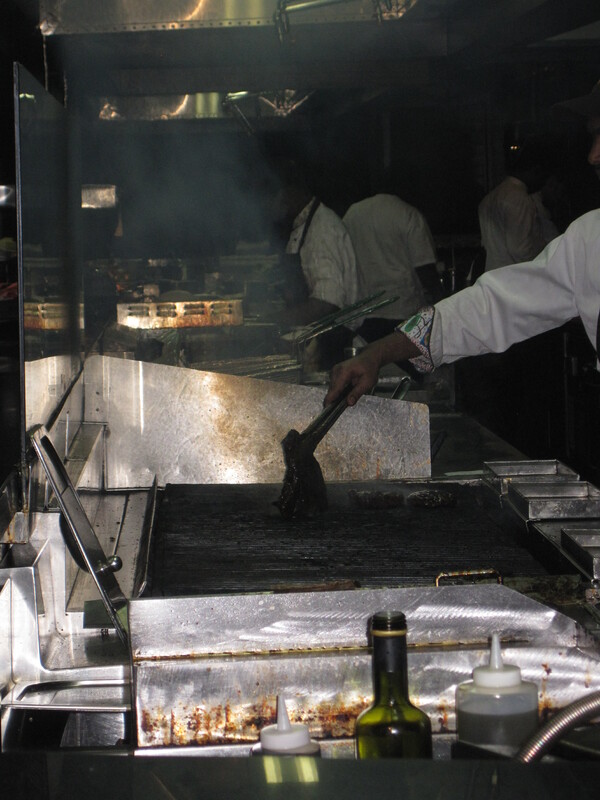 Making that meat magic happen! prices they charge – unless you snag a “buy one get one” type voucher from one of the group-selling websites. Now, even when you’re getting your bill, it’s presented in a lovely manner, see? 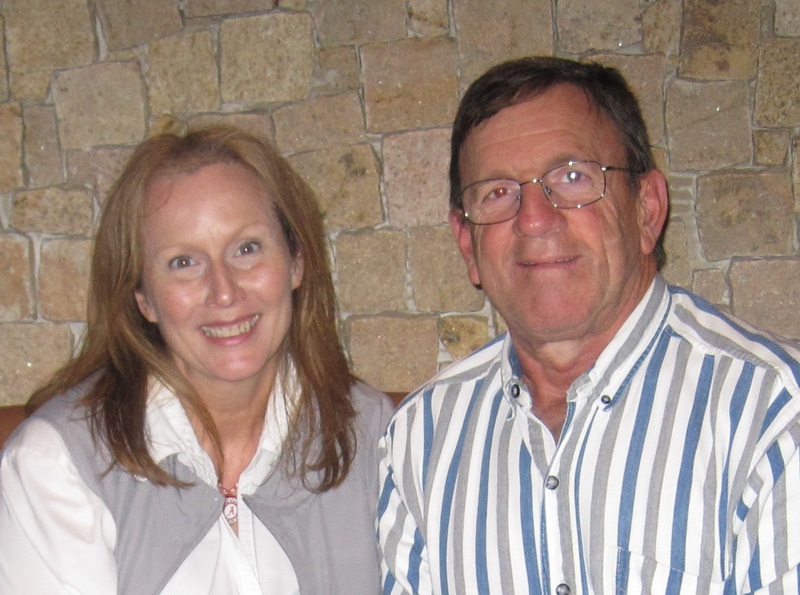 I followed my husband to Dubai for a job. Then, I followed him to Bahrain for another job. Now we live in a bigassbus and travel all over the US, seeing all the things we missed before. I adore adventure and hate that wench on the WiiFit. Collecting experiences is my new hobby. I type and write just like I speak - fast with a lot of errors, and they don't trouble me at all. I have a very short attention span, am able to Google for something and not come up for air for hours, I am an encourager, a cheerleader, organizer and able to juggle multiple projects at once. Your style is really unique compared to other folks I’ve read stuff from. Thank you for posting when you have the opportunity, Guess I will just bookmark this site. Well thanks, sizzling hot deluxe – people that know me in real life will swear that I write *exactly* like I talk…. fast with a lot of mistakes! Glad you’ve bookmarked me…. thanks for stopping by!